Back in the 1930s and 1940s in many of the villages of New England were held dances referred to as "Barn Dances" or "Round and Square Dances" or "Eastern Barn Dance Style Square Dances". As people did not travel the distances for recreation that we do today many towns had a local group of musicians who supplied the music for these dances, as well as a caller. This website documents one group of musicians, Myron "Mike" Colby's Orchestra, and the caller, Frank Fortune. This combination of talent and Yankee ingenuity resulted in one of the most popular dance halls in the central part of New Hampshire. 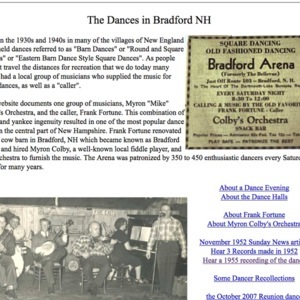 Frank Fortune renovated an old cow barn in Bradford, NH which became known as Bradford Arena and hired Myron Colby, a well-known local fiddle player, and his Orchestra to furnish the music. The Arena was patronized by 350 to 450 enthusiastic dancers every Saturday night for many years. The website was created by Boston area musician, caller, and organizer Walter Lenk, using material collected by Myron Colby's daughter, Janice Colby Boynton. It is a resource-rich portrait documenting a successful local dance series in central New Hampshire, containing text, newspaper clippings, photographs, dancer recollections, and a live recording made in 1955 by Jack O'Connor, documenting an evening's program. 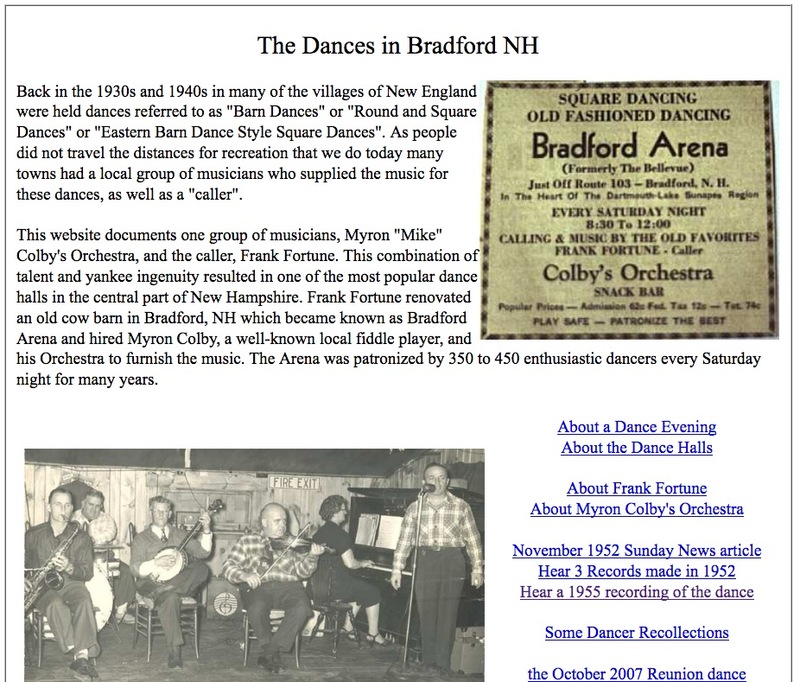 Walter Lenk, “Frank Fortune and the Bradford (NH) Barn Dance,” Square Dance History Project, accessed April 26, 2019, http://squaredancehistory.org/items/show/478.